There are a number of different situations in which you might like to get a single poster printed for personal use. You might like to get a nice family photograph printed in large poster format, either for displaying in your own home or to give away as a unique gift. Maybe you are a digital artist, and would like to get a professionally printed poster of a piece you are especially proud of. We can offer premium quality, a range of options, and competitive prices on single posters making our service ideal for individuals who want them for personal use. A choice of sizes and paper types combined with advanced printing methods ensure that the results will be truly special and will look highly professional. Posters are a great way for small businesses to advertise themselves in the local area, as well as other organisations such as charities. If you have a sale on, some kind of event coming up, or anything else you would like to advertise to the local community, then putting up posters is a great way to get it noticed. Buying space to display your poster is a very affordable yet effective way to get it seen by a broad spectrum of the local population as they pass, and we can handle the poster printing side of things in a similarly cost-effective way. Whether you want a single poster to put up outside your own premises or a small print run to place strategically through the local area, our London poster printing service offers high quality printing methods and competitive pricing to help your posters stand out and add value to your business. A lot of London poster printing services specialise in large-scale, commercial print runs and are quite expensive if you just want to get a small number of posters printed. Supposing you are an artist who is just starting out at trying to make money, and wants to have a few posters of your work printed without a heavy financial commitment to see if you will be able to sell them? Or part of a small band that is becoming quite successful locally, and you want to tentatively try out selling posters at your gigs and see if anyone will buy them? 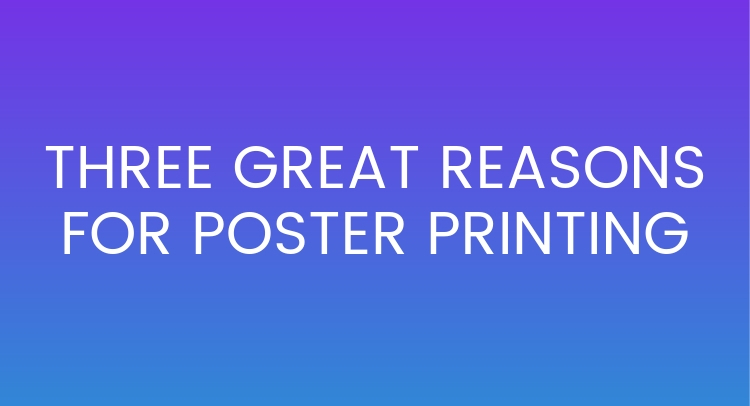 We offer great prices for even small runs of posters, right down to a single poster. If you want posters to sell but want to start with just a few, our London poster printing service is for you. to track the progress of your order.